So there used to be this thing called Bitpass. 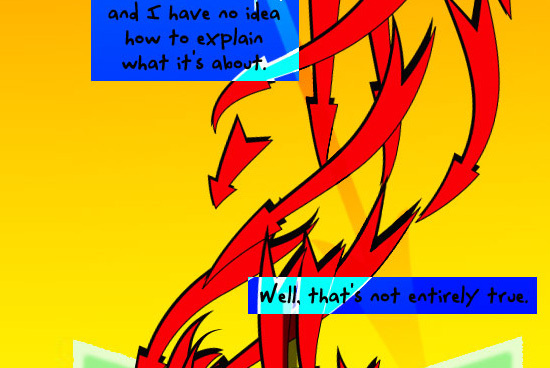 When it was originally launched, it focused pretty heavily on monetizing webcomics. I was invited to be a beta tester of their system and create content for sale. This was 2003 and although it seems somewhat silly now, there was very little movement in terms of an easy way for someone to pay $0.99 for a piece of digital content. Although Paypal was available, the fees made it prohibitive to charge small amounts for content. Bank fees also made it prohibitive to make small transactions, and Bitpass aimed to remove this trouble by combining small payments into larger chunks. Users could open a Bitpass account and keep it stocked with 10 bucks or some general amount then search through Bitpass’ merchants for content they wanted. My idea was to create a series based on the idea of directions. I was interested in the idea that all webcomic reading was basically Western in nature. Everything hinged on a “Right-Top” conveyance of information. You write html code in a right-top fashion to render a webpage from the right-top, down and across. No one had made a webcomic that you read from right to left. Or better yet, from bottom to top. So, four comics for four directions. And a forward, or prelude, to introduce the information. This was useful for sales as I already knew that no one was going to buy even a single installment of this comic without some idea of what they were in store for. You can read the Introduction here. I’ll be posting the 4 installments soon, and the links at the bottom wil be activated. In full disclosure, I think I made about $15 with this comic. It has been the only $15 dollars I’ve ever made from webcomics, and probably the most honest money I’ve ever earned. I’m indebted to everyone who bought it.